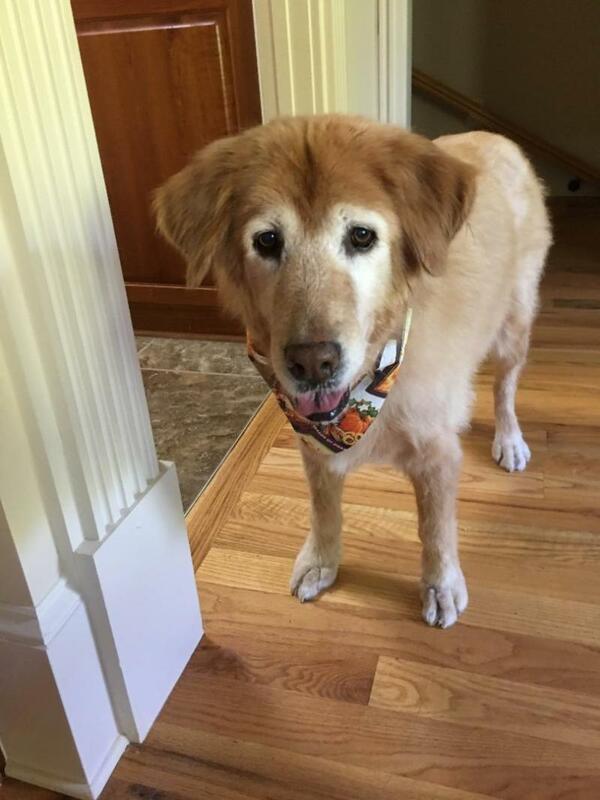 Looking at the GRRA website, I noticed a sweet senior named Copper. 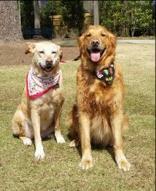 Her photograph spoke to me, “I want to go home with you.” I have two rescued seniors, Charlie and Lacey. Copper would fit in perfectly with them, I just knew it! I contacted Melinda Lahmers, my adoption coordinator, about my interest in Copper. Soon I heard from her foster family, and we arranged a time for me to meet Copper. It was a long drive from my home in Statham to Peachtree City where Copper was staying. When I saw her, I immediately felt a connection with her. 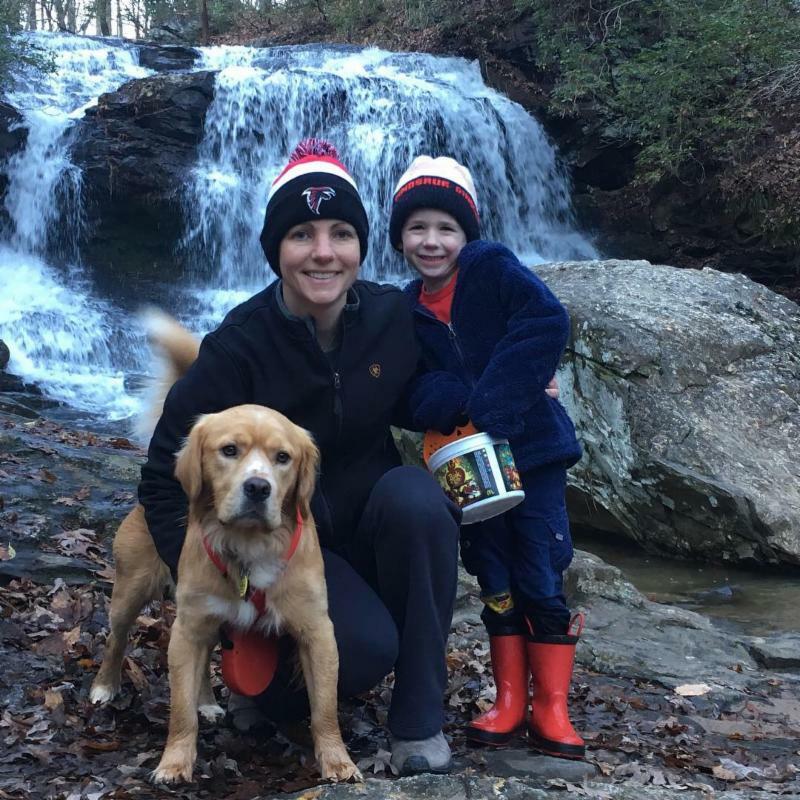 Having been picked up as a stray in Atlanta, she needed a family that would love on her. I didn’t care that her coat was in poor condition or she didn’t respond to my words or was so arthritic she had trouble getting up or walking. I just wanted to adopt her. Her fosters helped me lift her into my car, and we were on our way to Statham. 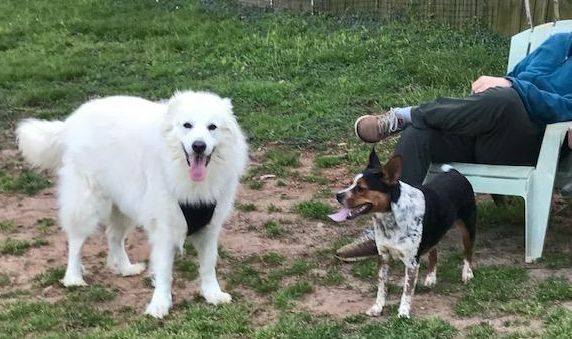 Copper, Lacey, and Charlie got along right away. Just a little sniffing but that was it. Next, Copper went to see our vet. 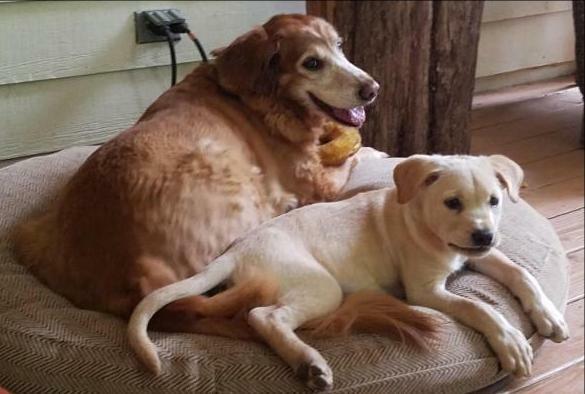 He discovered she is deaf, her vertebrae are fused from her hips to her tail, and has a limited strength. 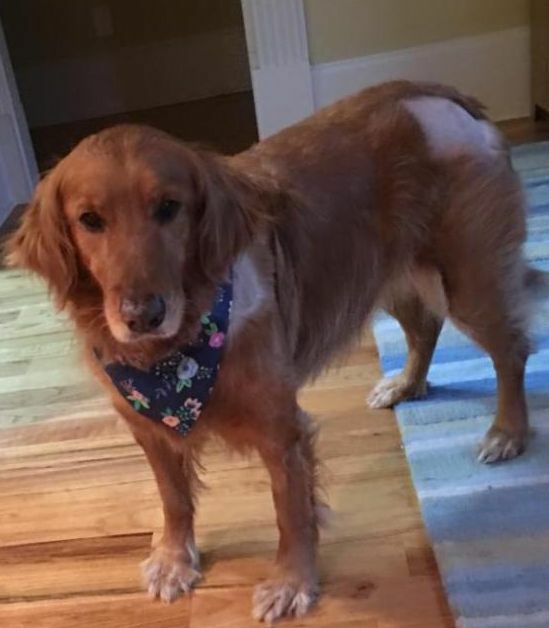 He suggested physical therapy at the University of Georgia Vet School to help with improving her mobility. 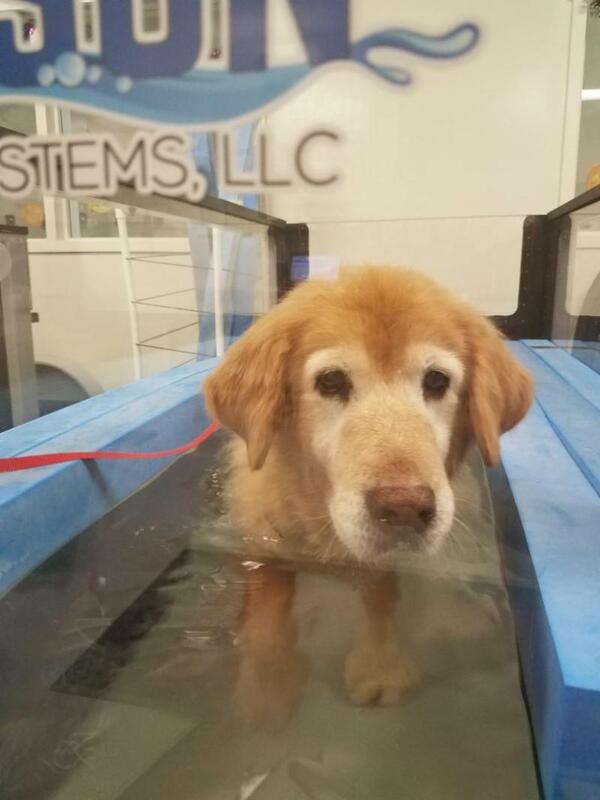 Copper went to UGA and started with “sit to stand” exercises and the underwater treadmill. Copper has homework too-working on “sit to stand” reps and taking a daily 20 minute walk. She was given a harness to help me help her to stand. Copper is the most wonderful dog, and I thank GRRA for taking her into their program. She has so much love to give and has been such an inspiring delight. Hooray for seniors! Chapter One of this Happy Tales story started when this sweet girl was rescued with her litter mates from a dumpster. Thankfully, GRRA saved the day! We joined GRRA in search of a new love following the recent losses of two of our 4 retrievers. 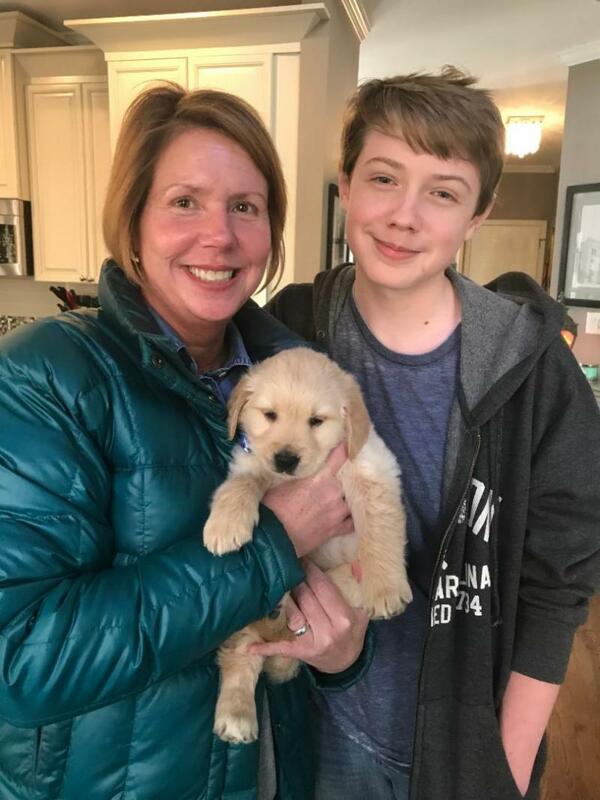 We decided that a new puppy would bring much needed positive energy to our sad home. We were very impressed with the GRRA application and vetting process and fully expecting to wait for the exact right match for us. GRRA April, now Tilly, came to us when she was just 8 weeks old. Like we had hoped, our home became very lively! When Tilly arrived, she was recovering from a dog bite to her nose and continues to sound a little bit like a piglet. This girl could have been aptly named many things like Lucky or Chance. But, “Tilly” came to us just as serendipitously as she did. Tilly is incredibly smart and has been practically house trained since she arrived. She loves to retrieve balls and toys and is so inquisitive. It is a joy to watch her follow our senior retrievers Ella (11 yrs.) and Woody (12 yrs.) around and learn their behaviors so quickly and beautifully. Tilly loves to walk by the lake and she takes to the water like a champ. She loves to fetch a stick and swim like she has been doing it for her entire life. I had the great fortune of adopting Mollie (now Mollie Grace) from GRRA this past April. I have always had dogs in my life, but I never owned a Golden Retriever. 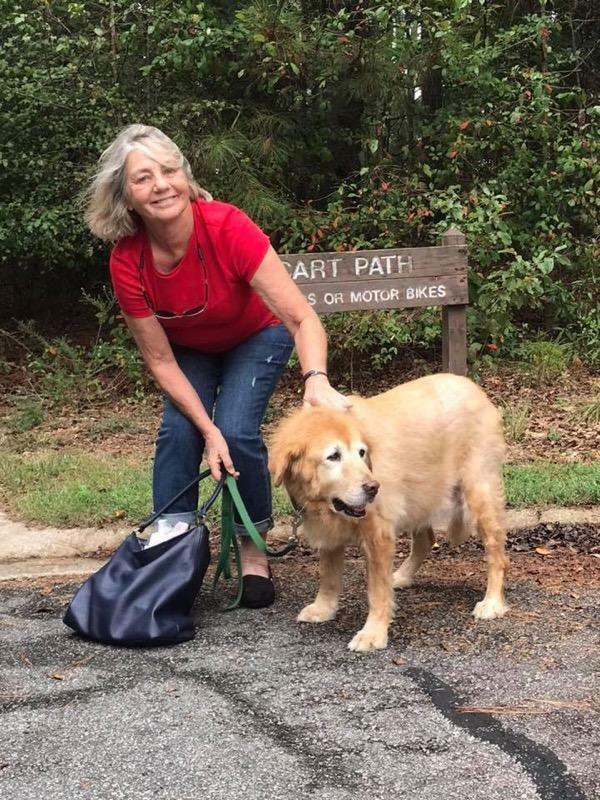 When I lost my amazing Labrador Retriever, Bella, at 17-years-old last year I was heartbroken. I knew I’d get another dog someday, but I did not expect it to happen so soon. I became aware of GRRA during my time with Bella. 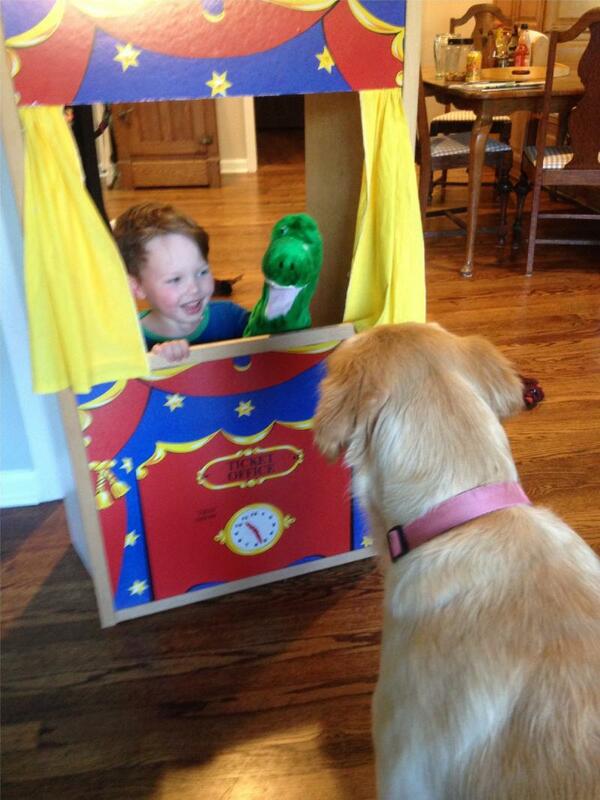 My good friend adopted a 2-year-old Golden Retriever from GRRA named Atticus (now Bentley). Bella and Bentley became fast friends, Bella taught Bentley how to be a great dog while Bentley kept Bella young and playful. 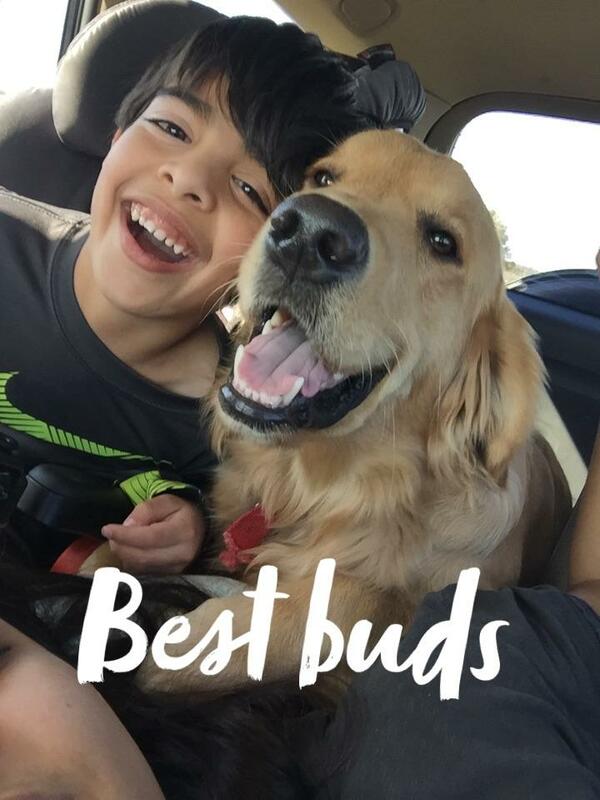 They were best friends and spent a lot of great times together. I have very fond memories of them together. I was incredibly lonely once I lost my sweet Bella. I finally made the decision to adopt from GRRA so I could have time to train and play with my new pup. Being a teacher, I have the opportunity to enjoy some time off during the summer months and I knew I wanted a furry companion to accompany me on my adventures! I began the application process with GRRA and I was amazed by the thoroughness and knowledge of the adoption consultant. 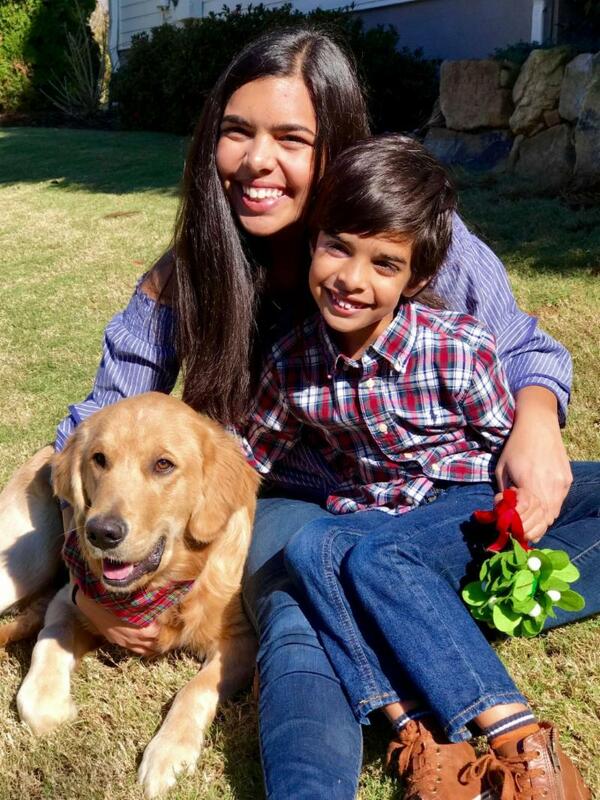 Every step of the way I was told what to expect and I understood that the most important aspect was to ensure that each dog adopted went to the right type of home and owner. I appreciated that so much because my biggest concern was not finding a dog that would be a good fit with my lifestyle and vice versa. I attended my first adoption day and met lots of cute dogs. I had been given information about dogs that might be good matches prior to the event so I knew what dogs I’d be focusing on. If not, I would want to take every dog home the moment I met them! My adoption consultant, Amanda Dytor, prepared me on what to expect and I finally had the chance to meet her that day. There were so many great dogs there, but the ones that I had my eyes on did not seem like they would be a great match due to me being single and not having other dogs and/or children. I was discouraged at first, but I understood the reasoning behind the decisions. I knew there would be another adoption day where I might find my future fur baby. I was about to leave that afternoon when I noticed a beautiful dog that was near the front of the store. I noticed her during my tour around meeting the other dogs, but I couldn’t get a good look because so many people were around her. I decided to wait and see if I could get more information. 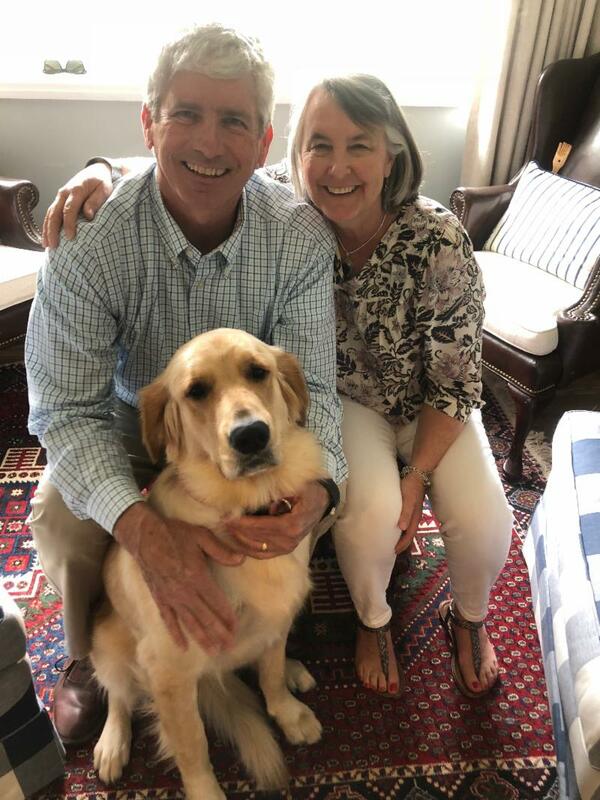 I learned that Mollie was a three-year-old Golden and I had a great conversation with her current foster, Susan Swartz. 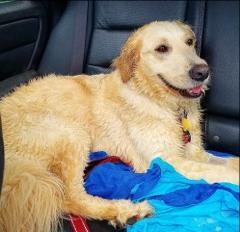 I voiced my interest in Mollie, but I really did not think I’d be able to adopt her since there were so many interested people --- mainly families --- and I figured they would have a better shot than I would. I received a call when I got home from Amanda, my adoption consultant, letting me know that the foster, Susan, would be in touch with me. I was elated, but tried to keep my cool as I did not want to get my hopes up. About a week later --- after an official home visit and a great discussion with Susan --- Mollie became a part of my family! I could not be happier and I think Mollie feels that way too! She is such a sweet dog and loves going for walks and hikes or just taking a nap with me on a rainy Sunday afternoon. She definitely wants for nothing --- other than chasing those pesky squirrels in our yard. She absolutely brings joy to everyone she meets! Thank you GRRA for being such a great organization. From beginning to end, there was always someone there to check in and keep me informed. Your devotion to the dogs is amazing and I always sing your praises to anyone who will listen. 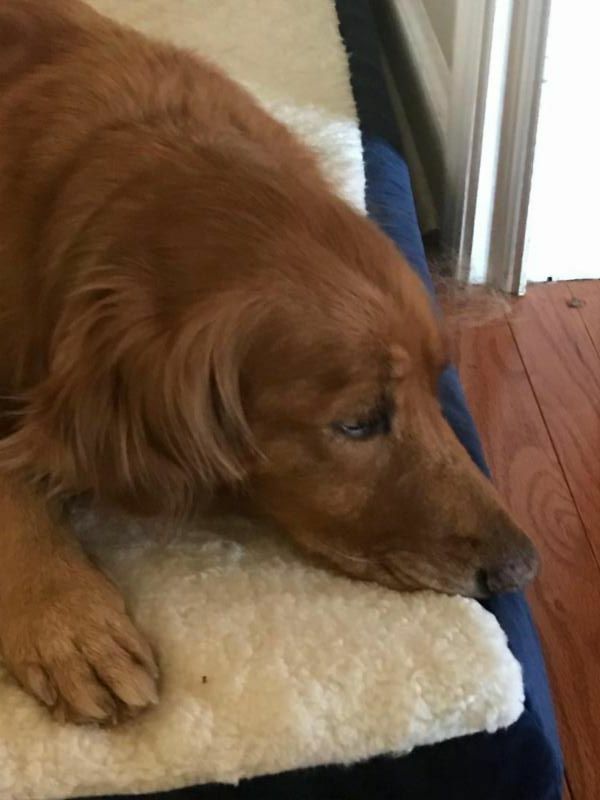 We lost our beloved Golden, Joey, in June 2016. After about 18 long months of waiting for life to calm down, we decided we were ready to be dog owners again. And we really wanted a rescue dog this time around. Friends kept suggesting GRRA, so we started the process and quickly got a call from Amanda who took us under her wing. We went to our first ---- and turns out only ---- adoption event. We were introduced to an 86 lb., 11 month old named Georgia. As rabid UGA fans, her name peaked our interest. Almost immediately, she absolutely stole our hearts! She is a goofy girl who loves walks, sticks, and tennis balls. She is forever trying to make friends with the crotchety, old resident cat. She has brought so much joy to our lives. Everyone that meets her can’t believe she was a rescue. Both Amanda and Georgia’s foster mom, Allison, were absolutely awesome to work with. My husband and I would like to thank Amanda, Allison, and everyone involved with GRRA for such a great experience and for taking care of our Georgia until she claimed us as her forever family! The email from Melinda Lahmers came late on a Thursday afternoon. I was just about to leave the house for lacrosse pick up. 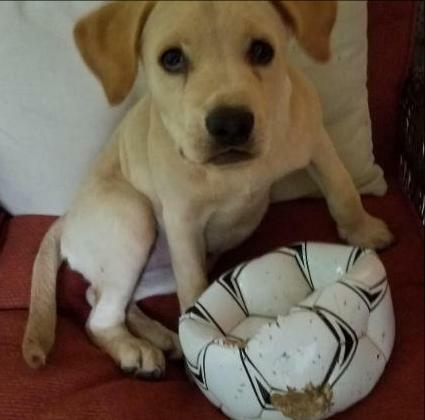 It read......"I wanted to let you know that we have an approximate 8 week old blind male puppy. Please let me know if you’d like additional information ASAP......". OMG! OMG! I would definitely be late for LAX pick up now! I immediately called my 14 year old son into the room and read him the email. As I headed out the door to pick up my daughter, I asked Gabriel to Google "blind puppy care." As I reached the middle school, I called my son and he told me a few things he’d already discovered online. Puppies who are born blind don’t know any different, so you don’t really have to feel sorry for them. That’s just the way life has always been for them. Gabriel also told me that blind dogs seem to do better with other dogs around. Bingo! We already had a 12 year old male Brittany and an 8 year old Smooth Fox Terrier. Gabe said it’s easier for a blind puppy to navigate his surroundings if he follows the jingle sounds of their collar tags. Having other dogs in the home makes them feel more secure. By this time, I was already on the phone to Melinda. When I returned from LAX pick up, I had to take one more step...... I had to tell/ask my husband. He’s a softie, so I was pretty sure he’d be in. 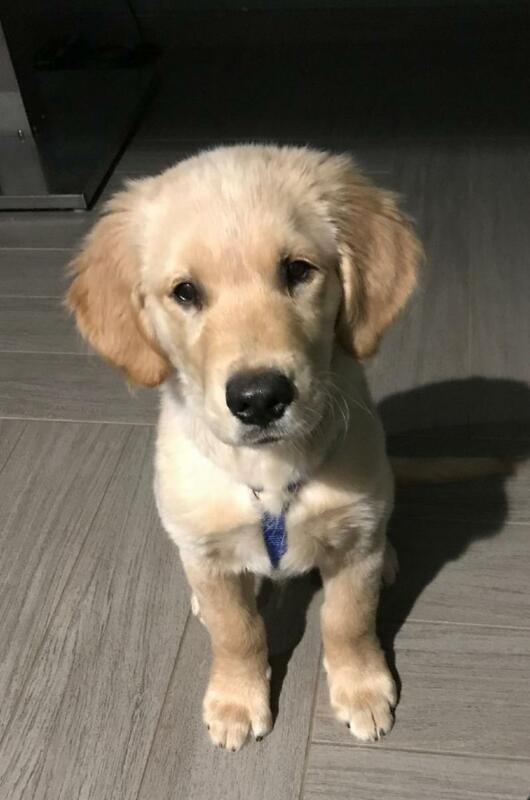 After all, when we signed up to adopt through GRRA, he laid down the law ----- Must be a Golden Retriever and must be a puppy. As a result, we had said no to a lot of other adoption possibilities which was really hard, but this one was not only an amazing opportunity but also a fit for our narrow parameters we had already discussed as a family. At dinner that night, we voted on names for our possible new pup. 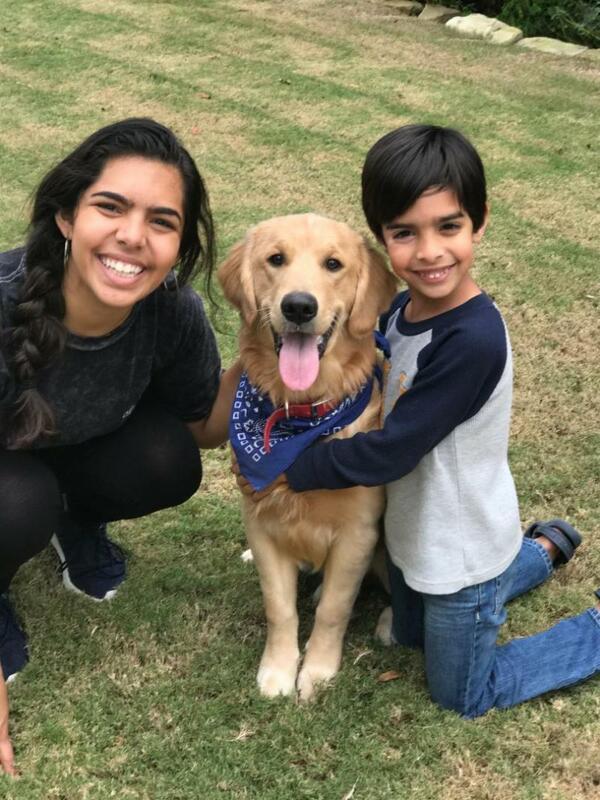 We had a Roscoe and a Roxie and had fostered a grown Golden Retriever, Rufus, who instilled in us our love for the breed. Several good possibilities were tossed about and then Gabe said “Samson” because of the strength of the biblical character due to his flowing mane. My husband Bill pointed out that biblical Samson was actually blinded at the end of his story. Gabe and I drove to Lori’s house that following Sunday morning. 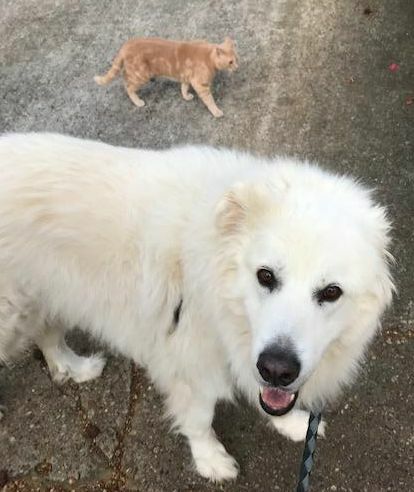 It was immediately apparent that sweet Samson had some semblance of sight. He sat and snuggled in the car right next to Gabriel all the way back to our house. The introduction to Roscoe and Roxie went fairly smoothly. We watched closely for a few days and then began putting Roxie (his new best friend) in the crate with Samson at night so he didn’t feel alone. Next came the challenge of the doggie door and the deck steps down to the yard. With a few days of training and some doggie treats, Samson managed going outside and down the steps to go potty. Success! We learned to change the texture under his feet around the house where a transition would occur to give him an alert while walking. We had a mat by the doggie door and another at the top of the deck steps. He doesn’t even hesitate with getting around these days. 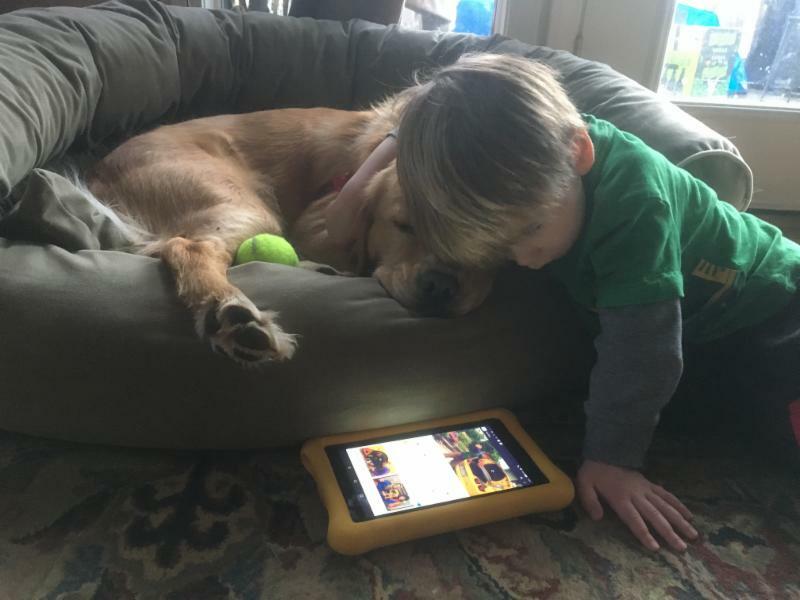 We are so happy with our sweet puppy and so happy for the gallant efforts GRRA took to rescue this very special Golden. We can’t imagine life without him. Jenna didn't have all of her baby teeth when she arrived and she came with her very own baby blanket. My granddaughter Rachel, who was just 10 at the time, immediately fell in love with her. I explained that we were just taking care of Jenna and were going to take her to GRRA in 2 weeks. She said she understood, as we all did. It didn't take 2 weeks. 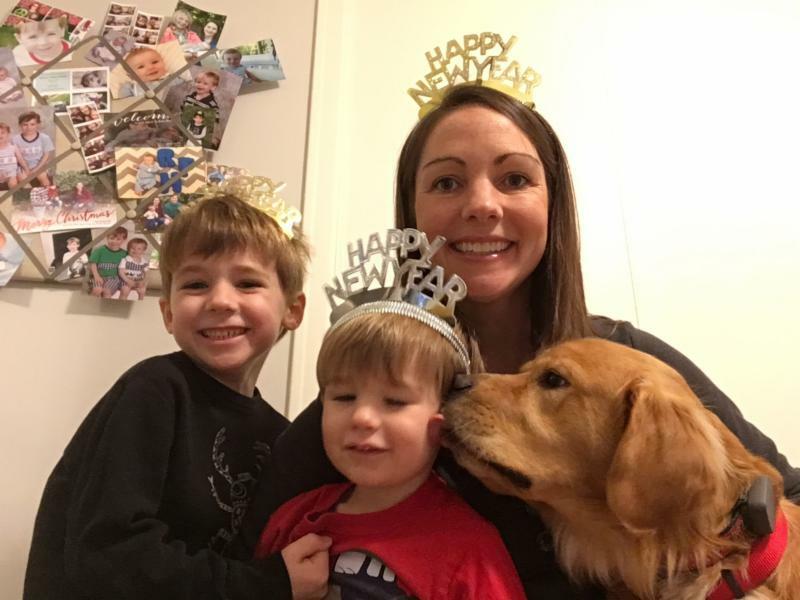 More like less than 30 minutes and Jenna had us all wrapped around her little paw! We tried to be strong ----- live up to our original plan of getting another furry family member down the road sometime. 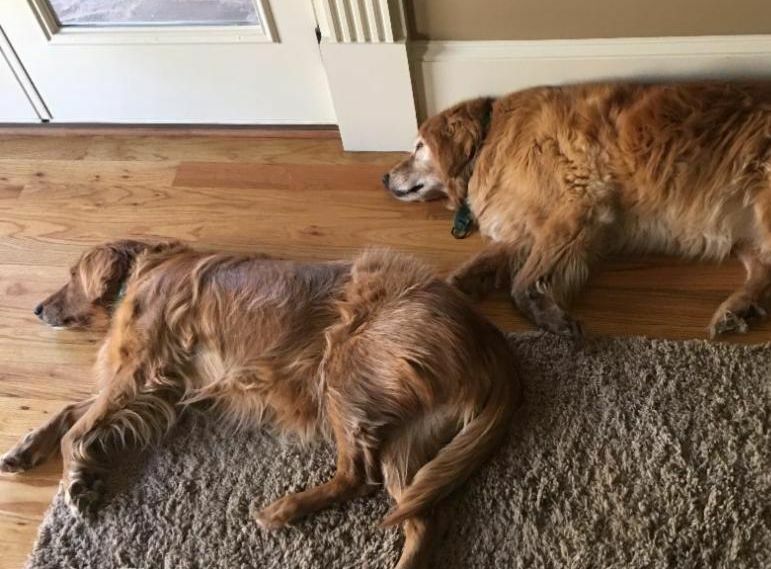 Sadly, we had just lost 2 dogs within 5 months of each other. They were 14 and 15 years old. Finally, the day came when we had to make the trip to take Jenna to see Susie. It was so hard, but we agreed that it was the best thing for Jenna. Yes, I signed the paperwork. Yes, I was sure. Yes, I was strong. Until on the way home. My granddaughter and I cried and cried. She said to me, "Nana, I NEVER want to do this again." We immediately decided to start the official adoption process with GRRA. Everyone with the organization was so very helpful and understanding. We went to Atlanta and picked her up. It was a complete surprise to Rachel. When she saw Jenna, she cried, "Jenna, you're HOME! You're back!" And Jenna was all over Rachel, too. Jenna and Rachel have completed both Puppy 1 and Puppy 2 Training. Eventually, they hope to complete the AKC Canine "Good Citizen" Program. 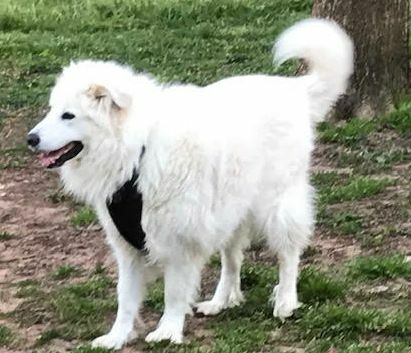 Jenna is healthy, happy, loves to play, never meets a stranger, funny, and has her family just about where she wants them. There is nothing better than hearing a squeak from a toy and then the pitter patter of 4 little paws running down the hallway. 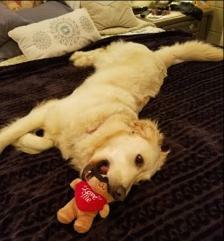 We are eternally grateful that Jenna has her Furever Home with us. A special thanks to all of the GRRA folks who helped bring Jenna back to where she belongs.